We have lots of animals such as Coyotes, White Tailed Deer, Foxes, rabbits, and others like that. What is more exciting is that we have seen Otters in the creek! Not just one or two, but a group of about four. Our neighbours have seen them too - I think they are quite rare. Just tonight we saw our first Possum - that's not such good news, but we're on the edge of a large meadow, bordered by large trees on the one side, the creek and then a large wooded area that the city keeps naturalized. This submission is from a reader in Barrie, Ontario, who has seen the elusive North American River Otter, Lontra canadensis. The North American River Otter, which is a member of the Weasel family, hunts during dark of night, and they prey upon fish, various amphibians, turtles, and crayfish, when available. Otters are typically nocturnal, however, they seem to be more active during the day in winter-time. The otter digs a burrow and builds a den close to the water's edge in a river, swamp or lake. The den may have several tunnel openings, one of which usually allows the otter direct access to the water. In these burrows underground, female Otters give birth to their litters of between one and six babies. 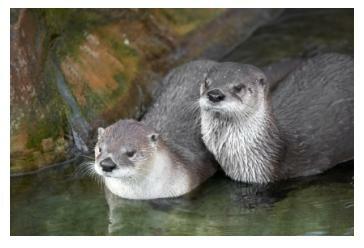 Thank you Paul for sending us this information about the Otters! Spotted an Otter running on the snow this morning about 100 yards from the shore of lake Ontario. This was in Confederation Park in Hamilton. I couldn’t believe it, but I was watching an Otter yesterday morning (December 26th) come up the path from the creek and investigate the property. He was about 10 feet away from me when he spotted me and scurried back to the waters edge, slipping in the water (Sandusk Creek) as smooth as silk. We are located in Selkirk Ontario right down on the lake, where Sandusk Creek meets Lake Erie. I spotted an Otter behind one of our ponds this morning. It had a fish in its mouth. Our ponds for the time being are full with largemouth bass. We live just north of Greenbank on hwy 12. Otter spotted crossing road by river in Demorestville, Prince Edward County. I have seen 4 Otters on High Lake in Muskoka this year. Usually swimming the edge of the lake hunting. Saw 3 little ones on Whitestone Lake! We saw an a small young Otter on our property on Sunday, we are waterfront on lake Couchiching. Was surprised as I didn't realize that they would be here. I guess that they swim up from the Black River. Thought that it was a snake at first, but it came out of the water and went back in the same direction that it swam from. My wife and I saw a family of 4 Otters at Big Hawk in Haliburton. So cool! Saw an otter twice this weekend on our shoreline on Lowr Buckhorn Lake in Buckhorn! It was running with a fish in its mouth. Watched an Otter fish and eat his catch on an ice floe just off our shore on Eels Lake. Saw two this morning swim from shore out to the ice and run / slide across the ice to the island. Pretty cool. April 26 evening I saw a large Otter on our grass on Lake Simcoe near the narrows. The first one I have ever seen here in over 30 years. It was rolling around on the clover and rubbing its face into the grass and generally enjoying the spring weather. Then it amble off. What a lovely sighting! Saw and Otter today in our subdivision north of Newmarket - in Sharon, Ontario. Could not believe it! For the past several days we've had the pleasure of watching an Otter fish and play on our shoreline north of Kingston, Ontario. Our lake is still covered in ice but near our shore there is an opening. Every night just before sunset it makes its appearance. What an amazing creature to watch. Spotted an Otter in Port Ryerse (Lake Erie) on the beach. I didn't know we had them in this area. An Otter crossed in front of me on the road near Wilmot Creek in Orono. We spotted one Otter two years ago feeding in the early spring from our preserve in Viewlake. We are on the lake just about a mile south of the entrance of the river to Lindsay. Yesterday we spotted one at the same spot as two two years ago and then to our surprise four more joined the first. The five humped across the ice and are feeding on fish, one of which appeared to be a large fish (more than two feet) which they were working on. We have some pics of the one and now have to get them all together. Saw a pair in the Ganaraska River north of Port Hope. I got a good look as they sat in the sun by their riverbank den. Spotted an Otter by the lake near Confederation Park, Stoney Creek! We were amazed to see the pair, they were way out in the middle of the lake, far from shore on a sunny Saturday afternoon just last weekend. Very awesome to see these beautiful creatures. Just saw an Otter in Lower Buckhorn Lake (Deer Bay area)! Three young Otters cavorting, wrestling and swimming on the left bank of the Humber River in the Weston area of Toronto at dusk (8 pm) today, at the beaver lodge in Raymore Park. The beaver lodge was occupied last summer but there is no sign of the beaver this year, and no sign of the mother. Several tunnel-like entrances in the bank close to the beaver lodge. They were having a great old time. Mom and youngster Otter spotted, Tobermory, Ontario. Two Otters running across our lawn headed for the surf. The larger one, suspected to be the mom, the smaller one suspected to be the youngster. Both had beautiful smooth and full coats of fur. Also looking quite well fed. So cool to see. They disappeared into the surf near our docks before I could ask them for a photo. Awesome. Yesterday, in the quiet of early evening we saw 4 adult Otters on a Lake Simcoe dock at Big Cedar point. They seemed to be really enjoying themselves and we were delighted to see them. I thought they were in the wrong ecosystem but some of the others who have posted, have seen them too. With all the high water out there I've been seeing a lot of bBeaver, Muskrat and recently American Mink and Otters. I also have video. Couldn't believe my eyes. Yesterday we spotted an Otter happily swimming around a reservoir in north Ajax on the west side of Audley, between Taunton & Rossland. Very cool! Was kayaking summer of 2016 south of Gilford on Lake Simcoe, saw three Otters playing in water ahead then all three climbed on shore. Beautiful creatures. They were just west of Holland River mouth. I was about 30 feet away. Saw an otter today in Millhaven Creek in Odessa, Ontario. It was quite large and was having a grand time in the water. On April 8th, at the Goderich pier, we were watching a freighter being filled with salt when all of a sudden an Otter appeared along the ship. It swam the full length of the ship and then turned around and returned to mouth of the harbour. It looked like it was looking for a way up the shoreline to get out of the water ... Beautiful creature. Have had three Otter sightings. One in Bewdley on Rice Lake mid March, then same week east of there and again this week April 5. I work from home and have a perfect view of the South Shore. Not much escapes my attention. We've seen Otters along Lake Simcoe edge in Oro Station this winter. Today we saw 2 Otters together pop out of the water and jump on the ice. Last week we saw one Otter, 2 consecutive days. It was catching fish and coming up on the shore ice to eat the fish and then slip back down to find more. I have a cottage just east of Huntsville. I put a bubbler at the end of my dock to keep the ice from moving the rock crib. For the last five years an Otter comes in December and stays till April. I saw it this morning. They must like the moving water. I have never seen it in the summer. I found what looked like two trenches in the snow side by side ... with paw prints on either side - something slid all along their bellies around our Bay front. Could this be Otters? We are in South Bay, Prince Edward County. I hope it is!! Hi my name is Pat and I live along the Grand River in Caledonia. This morning my grand daughter thinks she saw an Otter getting on and off a sheet of ice in the river. I can't see any other reference to there being Otters in this part of the river system. Has anyone else seen them? I just spotted an Otter playing on the surface of the ice on Rice Lake. Ice break-up is just starting here, and another Otter joined the first, sliding and frolicking on the ice surface. What a short but wonderful sight. Just saw an Otter at the harbour front in Hamilton, Ontario. I went out to the creek in my backyard last night as the sun was setting and saw something swimming toward the property. I stayed still and was very quiet. It appeared to be a small Otter, possibly a baby. There was another one swimming a bit further away. The Otter came right to the edge of the creek just past my property and started to hop out then it saw me and went underwater. It was long and slender so I'm sure it was a river Otter. Very cool! I have seen an Otter twice in the last month in Eagle Harbour near Tobermory (Bruce Peninsula). Have spotted a pair of Otters on the south shore of Weller's Bay in Prince Edward County, Ontario. They were having a great time running and then sliding on the ice. I have seen them a couple of times this month, both times in the morning. Watching Otters on the lake. It seems like they are eating, playing and sunbathing. First time seeing this, there are three together and a few more scattered at different parts of lake. Nice to watch. A pair of Otters were sighted at Hay Bay near Tobermory on January 11, 2017. Driving home yesterday crossing the Loughborough Lake bridge I could have sworn I saw an Otter. My daughter and I pulled over. It looked like it was on a patch of ice with a fish in its mouth. We were baffled. Is it possible that it really was an Otter? Just saw one in Pickering. West shore by the pier. Saw two Otters on a rock in Three Mile Lake just outside of Burks Falls Ontario. Aaaand a Bald Eagle swooped down and scared them off. Bald Eagle in Ontario? Could it be? Saw an Otter at the Harbour in Downtown Oakville, Ontario, while I was fishing. He swam up on a rock and sat for a second and went back in. Cute. September 11, 2016 - I saw an Otter along the pier near the Oakville Historical Society. Such a surprise and delight! He ran along the pier and stopped, sat up, looked back at us for a quick photo op and jumped into the harbour! Saw my first Otters yesterday near Beausoleil Island on Georgian Bay. I paddled kayak close and they just watched and dove under water. A real treat! There was also a Bald Eagle nearby. Two otters spotted swimming at the mouth of napanee river just before hay bay. Adorable little things. Going to canoe tomorrow to attempt another sighting. I saw an Otter crossing the Howard Watson Trail in Camlachie last week. The tail was the clincher. I had no idea that we had them in the region. My daughter and I saw a family of five Otters at the bridge by Collins Bay and Bath Rd, Kingston around 8 am. I just saw three Otters in Duffins Creek in Durham region, just west of Westney Rd, south of Taunton. I saw an Otter this morning on Merlin Line, just north of Queens Line. Twice I have noticed a small Otter on the water's edge in Ajax, Ontario, at the base of Audley Road S. Once scampering along a log and another time swimming. I know someone who loves Otters. Does anyone know of any Otters in Barrie, Ontario? My cottage is on Meadows End trailer park and we suspect we have an Otter den on our beach! Meadows End is on Lake Dalrymple. An Otter ran across our yard today, then went right up into our deck. When I startled him, he took off into the bush and headed towards the canal (Trent Severn). He was between 3 and 4 ft. Long. Early May, I believe I saw a baby Otter along the shoreline of Lake Erie in between Erie Beach and the mouth of the Niagara River. My friend tried to capture it on camera but it was too quick. I just saw my first Otter while walking on the Waterfront Trail in Oakville, Ontario, near the Burlington and Oakville border. It was walking on the grass at the edge of the lake (Lake Ontario) and then disappeared into a burrow between the rocks at the water's edge. Saw three otters on Saturday swimming in Sheldrake Lake in Cloyne ontario. Saw an otter coming out of my mothers pond early morning. Loretto, Ontario. Had an awesome one run across the road in front of me. Just outside of Halliburton. Was definitely not a beaver or muskrat. March 24, 2016 - I just saw a pair of otters on our pond just north of Belwood, Ontario, this morning. This is the first time that I have ever seen Otters in the wild. Just spotted three Otters running out of our storm water management pond. They went up the embankment, across a foot path and slid down the other side on their bellies. First time I've seen any around here. I just saw an Otter running along our shoreline in South Bay, Prince Edward County, Ontario. Watched an Otter this afternoon on Marble Lake (Cloyne area) sitting on the ice about 100 meters from shore. Looked around a bit before diving back through a melt hole in the ice. I watched him eat a large catfish on the dock one morning this past summer. Can identify them swimming under water by the characteristic trail of bubbles. My house backs on to the ravine and I just spotted an Otter running along the semi-frozen shore. First thought - it was a squirrel as we have a ton of those, but the hopping along the shore gave it away. I had no idea we had Otters! Very cool. Awesome... my first Otter sighting. At 8:00 am this morning, I just happened to see something different out the window. I grabbed my binocs and low and behold there it was. A beautiful Otter coming up through the ice on the frozen river and enjoying its breakfast. Very chuffed to have witnessed this beautiful animal!!! I saw a fair-sized Otter in Lake St John, Ramara, Ontario, yesterday. February 15/16 While out for a late afternoon walk we viewed four otter in the Sauble River. We stood and watched in fascination for at least 15 minutes. The displays of chatter, diving, playing and hunting were an absolute delight. Second time this week I saw an Otter body sliding on the frozen lake (Bald Lake) in the Kawarthas. The Otter takes about 3 leaps and then dives onto the ice and snow and slides a bit, gets up and repeats the process. Two Otters sighted today, they poked their heads out of a hole in the ice on the Mill Pond in Marchmont (Orillia). One came onto the ice for a short time. Saturday Nov 28 2015 - Watching a pair diving and eating about 100 meters off shore in Caesarea just south of the Beacon Marina. I saw a big male Otter hit by car at the side of road north of Kincardine, Ontario. Also Otter winter tracks on the Nine Mile River north of Goderich. Tracks also found along Naftels Creek south of Goderich. So it appears they are making their way south on Lake Huron from the Bruce Peninsula. I live in Cavan, Ontario, and have a pond on the property. Last week I though I saw the first Beaver in about eight years. Today I spent about 20 minutes watching and discovered it is an Otter not a Beaver. When he saw me he kept up his routine but quite frequently was "barking" at me, so it was time to leave. Saw a large Otter (30 lbs) running through a large hilly maple forest (Sugarbush) 2 kilometers east of Horseshoe Valley Resort. There is no water close by. I have seen where they slide down hills in the winter, but this was my first real sighting. Cool !!! Went fishing two summers ago and were fortunate to see three Otters playing in a small bay. We went into bay to investigate - they had little fear of us. They were swimming /playing within 10 feet of our boat! Coolest day fishing I've ever had! Canoeing at Ken Whillan's Conservation Park, south of Orangeville, Ontario, two Otters swam across the lake, lost them at Lakeside. I saw three Otters this morning feeding in the Muskoka River near Wilson's Falls. I have never seen Otters here before. Saw a single Otter swimming across the Joe River between Lake Joseph and Lake Rosseau. Didn't know they lived here. Observed 11 otters eating in Bolton creek located in Lanark county. Three pairs of adults and the rest juveniles. May 20 2015 Saw an Otter at the dog park today. He watched us and then gave a small slap with his tail and dove under. Cheeky little face. Adorable. I saw an otter in Buckhorn Lake floating on its back. He was about 20 feet from the shoreline. Near Scotsman Point around 8pm. Very pleasantly surprised. Pretty certain we spotted an Otter yesterday in White's Bay, part of Georgian Bay, just west of Collingwood. Cute little guy, seemed to be enjoying himself paddling around close to shore, sighted in both morning & late afternoon. We live on Twenty Mile Creek in Vineland (near St. Cathernes) and saw a sleek little Otter playing in the current near our house. First time! Lots of Muskrats, but this is our first Otter! I saw an Otter today, in the wild, playing in the water at the edge of the ice today. This was at The Gannon Narrows Causeway, at about 4:15 pm. It was still there when I came back through, at 5:30 pm. He was having a good time. Beautiful animal. I regret I did not have my camera. I will head back tomorrow to see if I can get a pic. Awesome day!!! I had no idea we had them living this close to us. On January 13th 2015, My friend and I saw a small Otter come out on the shoreline of our lake Sturgeon in the town of Cameron. There was only one. We have an otter who likes to swim right in front of our boathouse. He is seen quite often in the morning and the evening. I believe that his den is located just on the shoreline behind the boathouse. He does not seem to be very shy as I was able to get within 7 feet to take a number of pictures. Last year we were walking on the trail running parallel to Wilson Road, right under the bridge that crosses Rossland. We saw what we thought were ferrets, but they were swimming and playing on the rocks. We finally figured out they were likely river otter pups. Did not see them again but there are coyotes aplenty, so maybe they didn't survive. At 6:30 this morning, I saw two huge otters on our dock - one bigger than the other. After watching for a few minutes the larger one slithered into the water and the smaller one followed shortly after. This was one the Big Rideau Lake in Ontario near Little Lake. We've come across a family of four Otters on Lake St John, north of Rama, the past three years. Very cool, and a sign you'd have to say of improving ecosystems. I've been on the lake for 38 years and never seen them before. I just saw a family of 6 or 7 Otters (hard to count with them diving and swimming) fishing in the lake. They were rolling onto their backs to eat the fish. First time in 24 years I've seen Otters on the lake! We have Otters which visit the south end of Four Mile Lake. The Otters often swim up into our floating dock and often lay on top of it just before sun down. We had 3 baby Otters born here this summer, all of which survived. I saw 2 Otters in Black Duck Bay of Lower Buckhorn Lake over the past couple days! So adorable ....I didn't know there were Otters there! I just spotted an Otter in my backyard pond. The pond is only about 12' x 15' x 4' deep. He was swimming around then got out on a rock. I got a good look. I saw a single River Otter enter the Thames river (west of Chatham). I have property in Willoughby Marsh (Niagara Falls/Fort Erie area) with a creek that runs to the Upper Niagara river. About 3-4 years ago Beavers moved into the marsh but seem to have moved out this spring. This morning had an Otter on my front yard and then into the marsh. approx. 3 feet plus and guessing around 20 lbs. I was out looking for a glimpse of the PANSTARRS comet and was on the shore when I noticed something dark and about 2-3 ft long. When I use my binoculars it was a Otter! First time I have seen one here, will try to get a picture later. I saw a dead animal in the valley, it had a tail like a raccoon but canine teeth. What could it be? I could not believe my eyes! In a spring fed pond located in Pottageville Park, I saw an Otter last week - went back today to sit by and quietly watch - I saw two adults and at least 2 smaller ones swimming and playing in the water. Went to visit my daughter and while we walked along the dock in Port Elgin there was a mother Otter and seven young ones. They seemed somewhat confused in the bustling marina and swam along the docks looking to escape. Yesterday my wife and I both saw an Opossum when we were having a BBQ in the early evening. At first we thought it was a cat, but as it walked closer, we were surprised to see it's pink nose and rat-like tail. It slowly wandered away when we approached him. We will keep the camera handy for his next visit! The River Otters are amazing! I'm so glad to hear they are around. The Possum, well, that's another story. I Live in Georgetown and we have had them here for at least 15 years. They like to winter in garages and sheds. They can be quite vicious when cornered, one attacked my cat and did a lot of damage!